Dentures Can Make Your Smile Beautiful Again! The desire and search for beauty are everywhere these days. From the entertainment news media to social media, movies, magazines, vlogs, blogs, and even books: everyone is chasing beauty. Quite a bit of what you find will have more to do with makeup; it changes with the seasons and years, it’s relatively inexpensive, and easily washed off. But there is also a side that focuses on permanent changes to your body for beauty’s sake. Plastic surgery and cosmetic dentistry procedures continue to increase as people search for a better, more perfect look. There’s really nothing wrong with wanting to look and feel your best. It helps your level of confidence; when you feel more beautiful, you look more beautiful. This is as true with your teeth as it is with your face or your body. 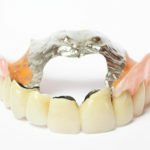 Dentures have long been thought of as utilitarian and unattractive. Older versions have a factory look to them – all the same regardless of the size of the mouth. But with modern technology, its possible to make dentures look so much like natural teeth that a casual observer will never know the difference. Your dentures won’t have any of the major or minor imperfections of your natural teeth! Whiter whites: If your teeth have been sort of yellowy-brown throughout your adult life, dentures can really brighten things up for you! Rather than making you look older, which many people unnecessarily fear, dentures can make your smile whiter than before. If you are only getting one arch or a partial denture, you may want to have a good cleaning and series of whitening treatments to make sure your natural teeth are as white as possible so the new prosthetic can be made to match! Evenly spaced: Chances are, if you’ve had to have several teeth removed and need a denture, you had a problem with the spacing or alignment of your natural teeth. This would have created spaces that were difficult to keep clean, promoting the decay that led to extraction. Some people are able to solve alignment and spacing issues with orthodontic treatment before it becomes a problem, but not everyone is able to use that solution early enough for good effect. If this is your situation, dentures are both easier to keep clean because you can remove and soak them, and made with a high aesthetic standard to make your smile more beautiful. Regular Shape and Size: One final complaint people have about their teeth is the size and shape. Teeth are too narrow, too big, too small, uneven in height over time. As you age, you may have one of two reactions to your teeth: if they have been irregular since the beginning, you may become complacent about their look, or you may become more and more unhappy with teeth that start to look old. 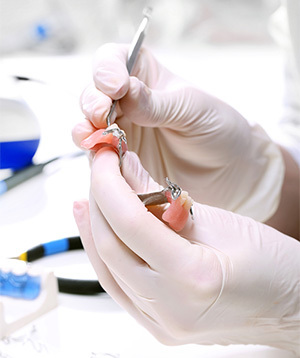 Either way, modern dentures are a chance for a fresh start with even, regular teeth that fit correctly in your mouth. Dentures can help you regain your confidence when you smile when you talk, and when you eat. We all know that though dentures may help your smile, they also keep you looking, sounding, and feeling younger while they protect your health. Eating and Nutrition. When you don’t have enough teeth, and the teeth you have don’t line up the way you should, eating can be problematic. You start having to cut up all your food, take small bites, and only chew on one side of your mouth. You may even feel like you have to move to a diet full of things that are smooth and easy to swallow without chewing. But no one really wants to be on a pudding diet for the rest of their life! Not only is that a little boring, it is also less nutritious! Even when you get vitamin supplementation in your soft food diet, you get better nutrition when you are able to eat real, whole foods. 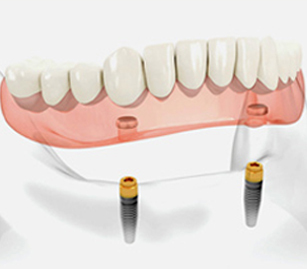 With a denture, especially an implant retained denture, you will be freer to enjoy your food again. Once you learn how to keep a removable denture in your mouth and learn to eat with dentures correctly, there’s not a lot you won’t be able to enjoy! Speaking. Think about the way you say the letters of the alphabet. Sure, the vowels are easy, open sounds, but recall the way you make the sound for C, G/J, L, S, and especially T. All those sounds, and others, require teeth. Without teeth, your speech may become a slurred, lisping, and hissing cacophony. Dentures allow you to speak clearer and more natural. Facial Structure. Your teeth support your cheeks and keep your jawbones strong. Without your teeth, you begin to lose bone mass in your jaw and your cheeks will sink in for a hollowed out look. While standard dentures can correct the hollows under your cheeks, only implants or implant retained dentures can maintain bone density. 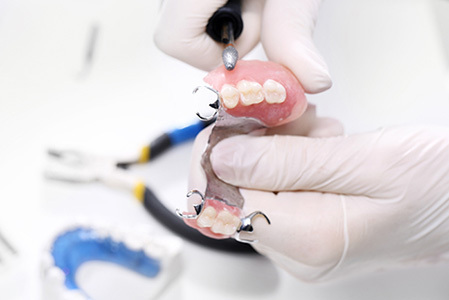 When it’s time to start investigating replacing one tooth or a full arch you have lots of options; dentures are usually the most cost-effective choice. Don’t let the misconceptions of older denture styles keep you from getting the care and treatment you need. 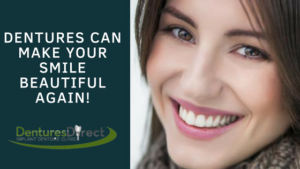 The #1 Denturists in Toronto at Dentures Direct Implant Denture Clinic can help create an aesthetically pleasing smile full of straight, even, white teeth. Call today to schedule your free consultation with one of our experienced denturists. 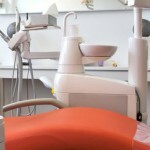 Getting Dentures for the First Time (Types & Steps to the Process)Implant Supported Dentures Are Easier Than You Think!